Jose (Joe) Patricio Ramirez was born on March 19, 1942 in San Antonio to Patricio and Francis Ramirez. He was the eldest of seven siblings. 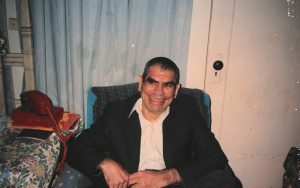 He is survived by one brother, Adolph Ramirez (Leli) and four sisters, Irene Casias, Beatrice Ramirez, Rose Schoenmakers, Sylvia Alonzo, and sister-in-law Gloria Ramirez, as well as numerous nieces and nephews. Joe is preceded in death by his parents, his brother, Louis Ramirez, and his brother-in-law, Rudy Casias. Joe was born with multiple health issues and required special care all of his life. Joe taught us that people with disabilities are like regular people with hopes and dreams who want love and affection. Joe’s dream was to come back with a healthy body. He would get married and have children. For the last three years, Joe was a resident at Mesa Vista. We visited daily. He enjoyed participating in activities and watching cowboy shows. He will be greatly missed. We love you, Joe. Rest in peace. A Mass to celebrate Joe’s life will be held at St. Francis of Assisi at 11 am on Wednesday, January 23.